It should be no surprise at all considering Wizkids‘ past history with the Marvel and DC properties and their game systems. Today the company has announced the DC Dice Masters Justice League Dice-Building Game. The game will be released March 18, 2015, the game will initially be released with a Starter Set to retail for $14.99, and Foil Packs for $0.99. The two player game will feature 30 heroes and villains, allowing players to customize their epic dice battles. The DC Dice Masters Justice League Starter Set comes with 44 custom dice, 38 cards, 2 dice bags, and the complete Dice Masters rulebook. This is more than enough for two players to get started. 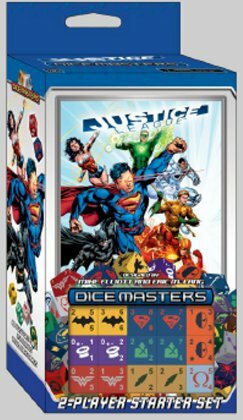 Each DC Dice Masters Justice League Foil Pack contains two cards and two dice that players can add to the DC Dice Masters collection.